The most complete solution for the garage of your smart home. Integrates with Apple HomeKit, Google Home natively and Amazon Alexa through iFTTT. Remotely control, monitor and watch your garage door from anywhere from your Smartphone. Includes the ismartgate LITE device, waterproof wireless garage door sensor and wireless indoor IP camera with night vision. 1 YEAR FREE VIDEO PLUGIN INCLUDED! A cost-effective garage door controller compatible with HomeKit. Integrate your garage in an Apple eco-system through HomeKit and voice control with Siri. ismartgate LITE also integrates with a Google eco-system. Make your garage part of a Google home and enjoy voice control with Google Assistant. ismartgate LITE is compatible with iFTTT for free (visit GarageWifi & Gates channel). Integrate your ismartgate with Amazon Alexa through iFTTT, to enjoy voice control of your garage with Amazon devices. You can also create unlimited applets with both our new triggers and actions! Open and close your garage door remotely from an app or web-link. Internet conection required. Receive alerts when door is open, closed or left open on your Smartphone or via email. The garage kit also monitors your garage temperature and sensor's battery condition. With HomeKit, you will receive alerts when door is stopped. Watch and record events in your garage remotely from your phone, tablet or PC using the ismartgate app. Additional IP Camera required. Grant and deny access to different users remotely. Restrict access by time, door and location. 10 users for free. 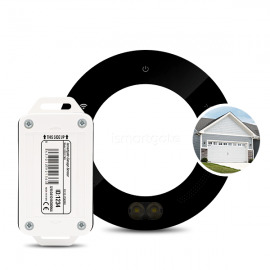 ismartgate LITE garage kit will only control 1 door. For two or three doors garage, we strongly recommend the use of our PRO version. The ismartgate app can control unlimited ismartgate devices. Check what happens in your garage from the distance with a built-in calendar of events. You can use and edit your ismartgate system from an app on your Smartphone (iOS/Android) or via web from your Tablet, Laptot or PC. App available for Apple Watch too. ismartgate LITE only requires a screwdriver and 20 minutes of your time. Easy to link with your Apple, Google or Amazon eco-system too! ismartgate LITE will open and close your garage automatically thanks to iFTTT app and phone's GPS signal. No need to use remote controls or pull your phone from your pocket. Link to iFTTT instructions. ismartgate LITE will open and close your garage automatically at a given time thanks to iFTTT, so you do not wonder if you closed the garage at night! Watch video in High Definition (1MP) from the ismartgate Cam. Feature available with ismartgate controllers (PRO/LITE). Diagonal angle of 116º for a panoramic view of your garage. Feature available with ismartgate controllers (PRO/LITE). The ultimate solution to control, monitor and watch your garage door in a single app from anywhere. The REMSOL return reference number must be prominently displayed on the outside of the parcel in which the Products are returned. Your REMSOL invoice must be enclosed with the returned Products. Products must be returned in the original packaging, in “as new condition”, and with all component products, parts, accessories, guarantee cards, manuals and other documents and items. Customer is expected to re-package the product properly in order to avoid damage during transportation and to ship the product to REMSOL at Customer’s own cost. If you return Products (1) which have been damaged or used, (2) after the 30 working days returns period (or other longer period specified by applicable law), (3) parts of which, including components, included products, accessories, packaging, boxes, documents and/or other items are damaged or missing, or (4) without pre-paid delivery, REMSOL retains the right either to refuse to refund the Product purchase price (subject to applicable local law), or to charge you repair, restocking or related fees and delivery charges. REMSOL may in that case deduct those fees and charges from any payments to be refunded to you. On return of Products, REMSOL will, subject to the above limitations, repay the actual amount paid to REMSOL in € Euros / $ USD / $ AUD, less any fees and charges due to REMSOL (as per the above), by crediting your relevant credit card or bank account (or other means). The issue by REMSOL of a return reference number shall not constitute an acceptance or acknowledgment of any right to return Products, except to the extent that these Terms or mandatory applicable laws confer such a right. The right of return does not apply if you do not purchase Products or Services as a consumer. The right of return and refund does not apply to software sold with REMSOL products, or as a separate product, if the license seal has been broken and/or shrink-wrap packaging opened. Further, you may not return a Product and claim a refund if the Product concerned is a personalized Product, such as an engraving or other means of individual personalization made in accordance with your specifications. All products returned to REMSOL will be analyzed to determine eligibility of warranty as per the limited warranty policy described above. If the product is determined to be eligible for warranty REMSOL will bear all shipment costs back to the Customer. If product is determined to be ineligible for warranty as per warranty policy described above, REMSOL bears no responsibility to fix the product and product will be returned to customer at his own cost. Easy to install IP camera compatible with ismartgate PRO, LITE and Gogogate2. Includes 1 Megapixel resolution, wide 116º angle, two-way audio, motion detection and night vision. 1 YEAR FREE VIDEO PLUGIN INCLUDED! *1 Year free video plugin sent via email after product's purchase confirmation.